Our Polarized Lenses are made from optical grade polycarbonate and are both impact and scratch resistant. They block 100% of harmful UV rays and are horizontally decentered to eliminate distortion caused by the frame wrap. Polarized lenses are designed to block reflected glare from uniform surfaces such as water, roads, and snow. This is accomplished by building a polarizing filter into the lens that doesn’t allow the polarized light to enter your eyes. These lenses allow fisherman to see through the sheen at the water’s surface and reduce the harsh glare that occurs on roads after an afternoon thunderstorm. 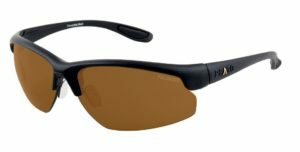 We offer polarized tints in dark gray and brown and green. The green tint is especially nice for fly fisherman that are continuously moving in and out of shadows because it is lightest, 100% efficient, polarized tint in the market place.